When you think of technology, the ocean isn’t the unlikeliest place to find it. Wind turbines, ocean liners, and GPS devices have all emerged as staples of sea-faring industries. However, one of the oldest aspects of the marine industry has quietly also become one of the most high-tech in the state. American Mussel Harvesters in North Kingstown is a leading producer of mussels in North America – but it wasn’t always that way. The company got its start in 1986 with one truck, one phone, and one boat. Today, they’ve integrated oysters and clams into its harvests and have trucks running up and down the eastern seaboard and across the U.S. with its fresh seafood. 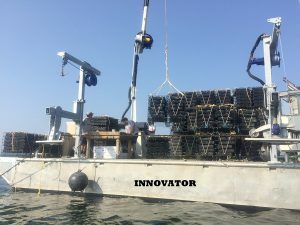 However, it’s not just the seafood that’s innovative: as one of Cox Business’ 2018 “Smart Business Tour” companies, American Mussel Harvesters has made innovation a central part of its operations, both on land and off. At the 2018 Cox Business “Smart Technology. Smarter Businesses” tour, American Mussel Harvesters presented a $2,000 grant from Cox Charities to the North Providence Marine Trades after-school program. The company first made waves in the 1980s when it introduced an industry innovation that has been copied ever since: a custom designed seawater system. This unique design pumps the cool, sterilized seawater of Narragansett Bay over the shellfish allowing the bivalves to filter out sand, grit, and trace bacteria in a controlled environment. The seawater system is monitored on a daily basis with salinity, ph., oxygen, and bacteria levels being recorded. The end result is a higher quality seafood product that arrives fresh when it reaches its final destination. This commitment to quality control is seen throughout the organization, including in how it monitors the activities of its production floor and loading dock. The company utilizes Cox Business Security Solutions for monitoring its daily operations via a large flat screen television that projects multiple views of the facility. If a worker needs to be re-located to an area of the processing line where demand has spiked, they can easily shift manpower around to keep their operations humming. Similarly, the Cox Business Security System has helped American Mussel Harvesters monitor activities on their loading dock. When a large truck backed up to the dock to pick up an order, it hadn’t fully latched in, causing a fork lift to be damaged as it drove onto the trailer. The video footage put to rest any speculation that American Mussel Harvesters was at fault, and the claim was paid out without issue. Smart controls don’t stop with video monitoring and security, however. American Mussel Harvesters also uses smart technology made possible by Cox Business Security Solutions to keep an eye on their property when the business is closed, which includes ensuring the building is kept at the proper temperature when the last employee leaves for the day. Given the need to keep their products within an ideal temperature range, HVAC controls are as important to the business as having a fleet of healthy boats and barges. 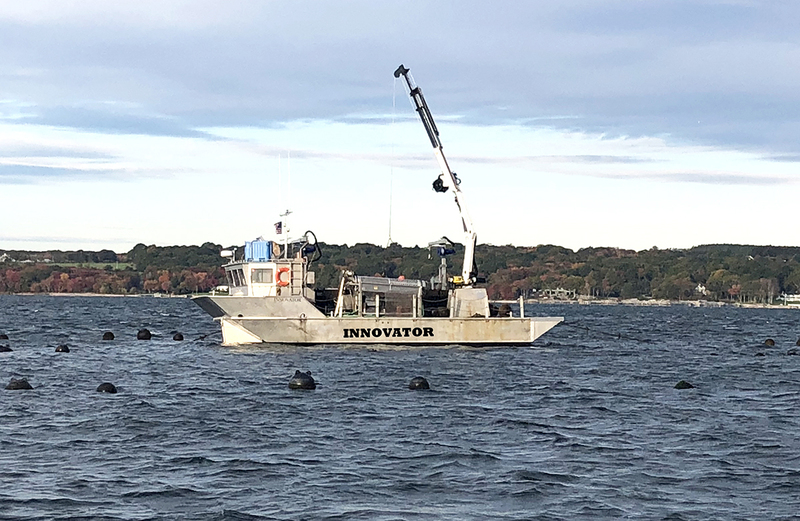 The Innovator is American Mussel Harvester’s “smart barge” loaded with technology that helps its crews do their jobs more efficiently and safely. As an industry, fishing and harvesting seafood is not a new profession. However, what American Mussel Harvesters is demonstrating is that even an industry almost as old as the ocean itself can adopt new technologies that yield improvements for customers and their bottom line. In its most recent technological feat, the company retrofitted a barge to become a “smart barge” that is able to maneuver with exceptional ease while also featuring a remote-control deck crane that pull traps up from the company’s shellfish farms, negating the need for workers to physically lug the heavy containers over the sides of the barge. 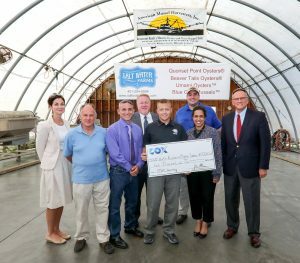 By cutting down on physical labor while also being able to shed the cost of recycling organic waste back on site, American Mussel Harvesters has built a barge that will pay for itself in short order. For more information about services from Cox Business, please contact Mark Marzullo at mark.marzullo@cox.com or 401-615-1814.